ALS (Autograph Letter Signed). 1p. Gads Hill Place, Higham by Rochester, Kent. Saturday, Ninth May 1863. To William Woodall replying to a request for him to read to the Wedgewood Institute. Together with a contemporary portrait photograph. "Sir, In answer to your obliging letter dated the day before yesterday, I beg to say that I can not propose any conditions on which I could have the pleasure of reading in Burslem. Faithfully yours", With a good full signature. 8vo. Approx 7 x 4.5 inches. Traces of mounting on verso, else Fine. 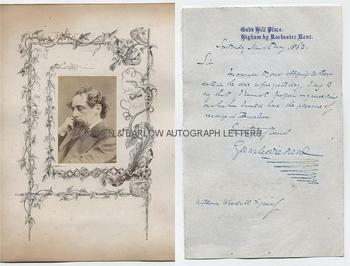 Together with an original contemporary albumen silver print photograph of Charles Dickens laid down on card within a border of fine original penwork decoration. The photograph measures approx 3.5 x 2.5 inches (excluding mount) and is in fine condition. Both the letter and the photograph are from a 19th century collection made by William Woodall, the radical Liberal MP and one of the trustees of the Wedgewood Institute.